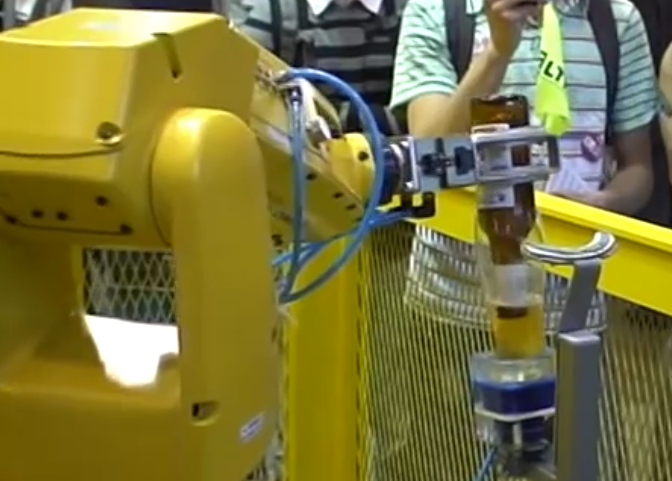 Yaskawa America's Motoman Robotics Division, located just west of I-75 and Austin Blvd, had a beer pouring machine similar to this at Technology First's "Taste Of IT" event last November. Nowhere near as fast as the best bartender, but very entertaining. The fastest bartender we ever saw was a young lady tending bar at The Doghouse Sports Lounge in San Jose, who spoke as fast as she popped tops, and we had to ask to slow down so we could understand what she was asking us. Pretty incredible.